Giving your time and spending it for a loved one is one of the most important gifts you can possibly offer, especially this coming Valentine’s Day. Another unique and perfect gift that your loved one would genuinely appreciate is a Gift Card for office cleaning and house cleaning service. Nowadays, most of us have little or no time at all to clean the house because of our very busy schedule. The same goes for business owners who tend to focus more on the business side of their responsibilities than tending to office surroundings. With that in mind, it would be very beneficial and helpful for your loved ones in that predicament to be presented a gift such as a Gift Card for house cleaning and/or office cleaning. 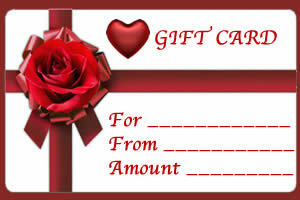 Within two to three business days the gift cards will be sent via mail to the address you provide. For sure, the recipient will be more than pleased to receive this thoughtful gift. They will be assured of a high-quality cleaning service from a family-owned company such as Rosie’s. 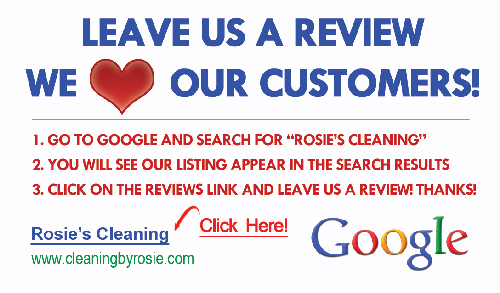 A proud member of the community, Rosie’s Cleaning has been servicing the area since 1990 and has long established its good reputation, resulting in a stable clientele. We are licensed, fully bonded, and insured, so no need to worry!